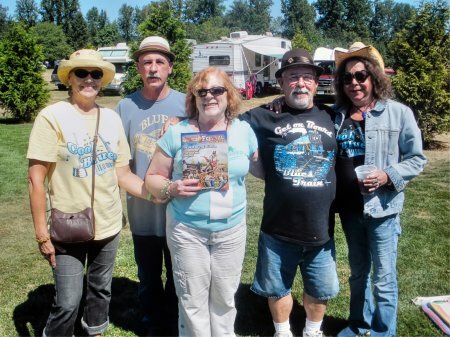 From left to right: Linda McShane, Tom Nolan, Jan Kelley, Rick Nolan and Kim DuVall show off their BFG at the Harvest Moon Blues Festival in Lebanon, OR on August 19, 2012. 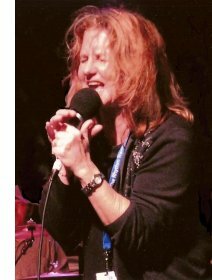 Jan, Rick and Kim are on the Board of Directors for the Sacramento Blues Society. 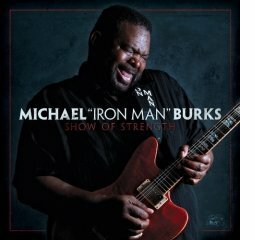 Show Of Strength, the final album from modern day blues guitar hero and vocalist, Michael "Iron Man" Burks. Burks had completed work on the album and was returning from a tour of Europe on May 6, 2012, when he collapsed and died while changing planes at Hartsfield-Jackson Atlanta International Airport He was 54 years old. Show Of Strength, on which Burks wrote or co-wrote five of the CD's twelve songs, is the album he felt would take him to the very top of the blues world. Burks' fiery music was driven by an intense, blue collar work ethic that won him a devoted worldwide fan base. His "Iron Man" moniker was born from his hours-long, intensely physical performances, his fearsome guitar attack and his tough, smoky vocals. It also came from the thousands of miles a year he personally logged behind the wheel of his touring van. From Show Of Strength's explosive opening blast, "Count On You" to the closing strains of Charlie Rich's elegiac "Feel Like Going Home," Burks' signature combination of feral yet tuneful guitar work with his gritty, dynamic vocals provide a searing, emotional autobiography in blues. The unstoppable, heartfelt intensity that Burks brought to the stage was the very core of his appeal. His passionate music and undeniable charisma made him an overwhelming force in the blues. On Show Of Strength, Burks is captured at the absolute height of his musical powers. 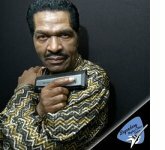 With taste, melodicism, and always in full command of his mighty guitar playing and soul-baring, fervent vocals, Michael "Iron Man" Burks leaves a legacy of extraordinary music, including the Show Of Strength ...a timeless statement of universal truth from a larger-than-life musician certain to become a blues legend. 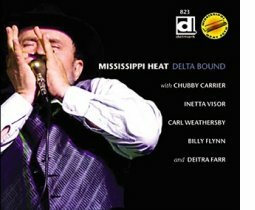 Delta Bound celebrates Mississippi Heat’s 20th year in the business, and their 10th recording. This is a strong and heartfelt post-war blues CD, with a true vintage feel. 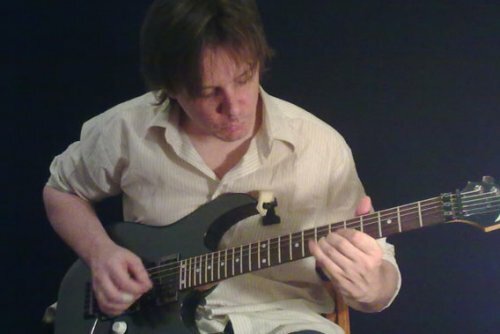 Fourteen original songs, twelve by the band's founder, Pierre Lacocque, and two written and/or arranged by Inetta Visor. Chubby Carrier, Billy Flynn, Carl Weathersby, and Deitra Farr appear as guests. Delta Bound is both a showcase for fresh material and an affectionate look back – Deitra has returned to sing a few songs; guitarist Billy Flynn, another early member, is also on hand to contribute his deft meld of rootsy integrity and forward-looking flash. As usual, the special guests – including Zydeco great Chubby carrier, keyboardist Chris "Hambone" Cameron, and fretboard mainstay Carl Weathersby – ignite almost as many sparks as the core unit itself. 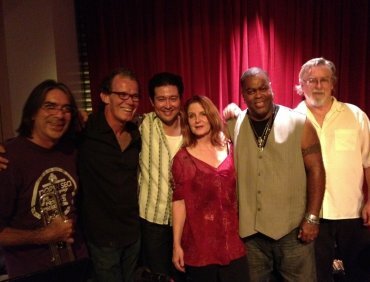 Through it all, the group's shared passion for blues expression, in all its soul-baring honesty, is palpable. "Sweet Ol' Blues, I'm so glad you're my friend," sings Deitra, in what could stand as both Pierre's and the entire band's theme song. "You are my trusted companion, now – yes, my pal, forever on end." 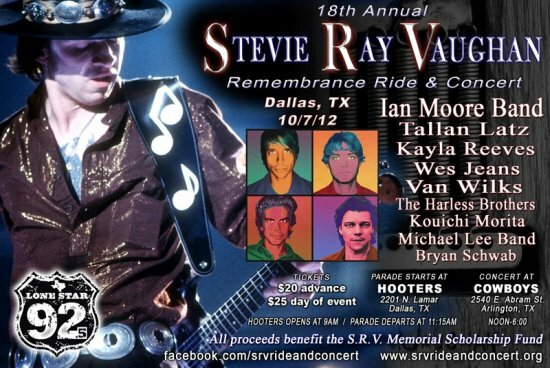 Presented by LoneStar 92.5 and Hooters, the 18th Annual Stevie Ray Vaughan Remembrance Ride & Concert, will be held October 7, 2012, rain or shine. The S.R.V. 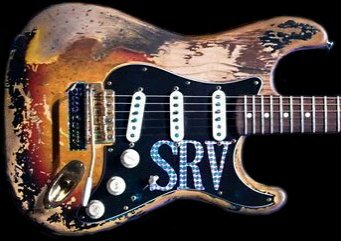 Remembrance Ride & Concert has become a family friendly event for motorcycle enthusiasts and music fans that come together every year to honor Texas’ most beloved bluesman... Stevie Ray Vaughan, a Texas legend. While remembering the life and music of S.R.V., enjoy a fun-filled combination motorcycle parade and afternoon concert! All proceeds from the event benefit the S.R.V. Memorial Scholarship Fund established by Martha Vaughan, Stevie’s mother. One of Texas’ largest motorcycle parades will kick off Sunday, October 7 at 9 am at the world’s largest Hooters restaurant in Dallas’ West End. The Dallas Police Department will shut down Interstate 30 and Hwy 360 at 11:15 am, bringing the parade to Cowboys Dancehall, 2540 E. Abram St., Arlington, TX. The doors open at noon at 3,500 sq. ft., tri-level Cowboys Dancehall for the 6-hour concert starring the Ian Moore Band (the original lineup), Tallan Noble Latz, Kayla Reeves with Wes Jeans, Van Wilks, The Harless Brothers with Kouichi Morita, and the Michael Lee Band with Bryan Schwab. Tickets are $20 advance / $25 day of event. All types of food and merchandise will be available for purchase at the event. Get you tickets now for the S.R.V. #1 Replica Guitar Raffle Package. Raffle tickets are only $5 each and there is no limit to number of tickets purchased. Drawing will take place at the October 7 concert at Cowboys Dancehall. You need not be present to win. 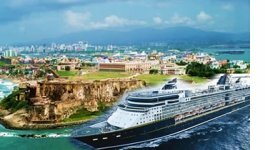 The "Package" includes (but is not limited to): the S.R.V. #1 Replica Guitar by Texas Guitar Workshop; Replica Guitar Strap by Christian Brooks; and "You Can't Stop A Comet," a book by Cutter Brandenburg filled with first hand memories of his good friend Stevie's road to history and 100 pages dedicated to photos. If winner is not present at the drawing, he/she will be contacted by phone and/or email. Odds of winning depend on the number of tickets sold. "She can sing like a bird or a bat out of Hell!" Check out her website for sample cuts and live videos of the band. ROCK & ROLL FANTASY CAMP TO HELP "RAISE THE ROOF"
The Blues Foundation is proud to announce that the world Famous Rock 'n' Roll Fantasy Camp is partnering with them to help "Raise the Roof!" 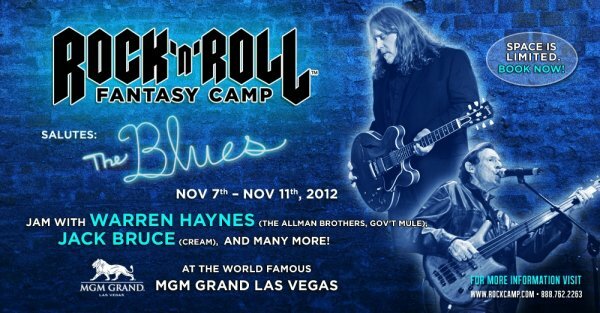 The Rock 'n' Roll Fantasy Camp Salutes the Blues will take place at the MGM Grand Hotel & Casino in Las Vegas, November 7-11, 2012. 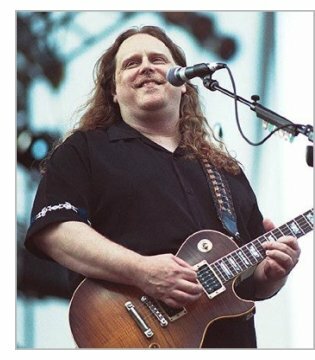 For 3 or 5 days you can jam, rehearse, record and perform the Blues live with superstars such as Warren Haynes of The Allman Brothers and Gov't Mule, Jack Bruce of Cream and John Popper from Blues Travelers and 15 other amazing blues musicians. The Salute the Blues Fantasy Camp is offering an exclusive offer to Blues Foundation members and affiliates. Book your spot and use the code BF 1000 to receive $1000 OFF your camp package. Not only will you get a $1000 discount on your admission to camp, but Blues Fantasy Camp will contribute an additional $500 to the Campaign for the Blues Hall of Fame. For more information visit: www.rockcamp.com or call Beth Porter at Rock 'n' Roll Fantasy Camp at 888.762.2263 Mention the code: BF 1000 to receive your exclusive discount! After each band's final performance, Rock 'n' Roll Fantasy Camp will auction off signed memorabilia and will split the profits 50/50 with The Blues Hall of Fame and the Rock and Roll Hall of Fame. Please help us spread the word about this camp and this offer. "Bridging the Blues" is 12 days of musical, cultural, and culinary events and activities, bookended by the two festivals. For a full list of Delta doings from Sept 27 - October 8, click here. We'll be busy at the Delta Blues Museum, maintaining our normal business hours Monday-Saturday, 9-5 pm, while opening extra hours for the many King Biscuit Blues Festival visitors who take the opportunity to cross the river to visit us: we'll be open on Sunday, October 7, from 1 to 5 pm. We're only 30 minutes away from Helena, come on by! King Biscuit caps an unusually busy summer at the Museum, with the completion of the construction of our new Muddy Waters Addition, the large crowds drawn to the DBM Stage by Robert Plant at the Sunflower River Blues and Gospel Festival, a reception for the "True Delta" film and photographic exhibit, and even "American Idol" auditions conducted on our grounds! It has been wonderful and hectic at the same time. 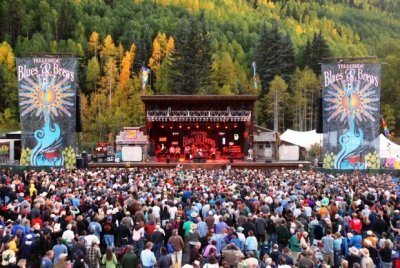 The Telluride Acoustic Blues Competition takes place at the Telluride Blues & Brews Festival every September. The competition seeks talented musicians who excel in the blues music genre and is open to any solo acoustic performer who is not currently signed to a record label or publishing deal. It draws over fifty entries from around the world each year. With over eighty hopefuls competing this year for one of the final six spots performing in front of a panel of judges, the competition was especially fierce. Walking away with the top honor, $300 in prize money and a Dobrato Resophonic Vibrato Guitar (valued at $1200) was Colorado Springs musician Jim Adam, known professionally as “Big” Jim Adam. Almost more important than the prizes, winning the competition meant that he would have a coveted featured spot on the festival itself. Adam performed before thousands of blues fans between headliners Anders Osborne and Trombone Shorty on Saturday afternoon, September 15, 2012. Performing is very important to Jim. To ensure an active schedule is maintained, he performs as a solo, with John Stilwagen, as the duo Adam & Stilwagen (sometimes adding percussionist Dave Deason to the act) and with the seven piece, Jim Adam Blues Band. Most fans will agree, it is Big Jim’s powerful baritone voice and songwriting that draws attention. Two of his songs, "Open Door Policy" and "100 Reasons," were recorded by Edgar Winter. Jim can be heard performing "Open Door Policy" in the 1992 film The Waterdance, starring Helen Hunt, Eric Stoltz and Wesley Snipes. The 2010 PBS documentary For Love of Liberty features Jim playing guitar and Diddly Bow for the soundtrack. 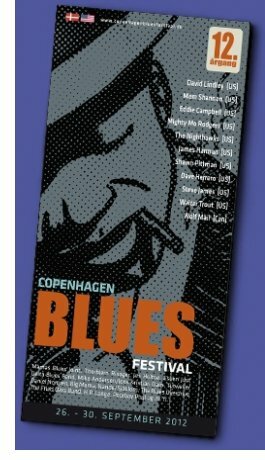 12TH ANNUAL COPENHAGEN BLUES FESTIVAL LASTS 5 DAYS! One of the highlights of the Danish Blues scene is the annual Copenhagen Blues Festival. 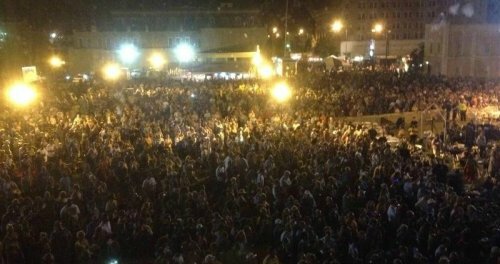 From Sept. 26th to 30th the Blues once again sounds all over the city. 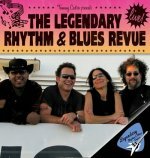 This is their 12th season, and they invite all blues fans to visit the city's clubs and venues for five days of world class international and homegrown blues. The festival's musical ambition is to find a good balance between the traditional and the new expressions of the Blues, and to cover all style variations in the best possible way. As always you'll find seasoned blues veterans alongside younger talents, who'll carry the torch into the future. Blues vocalist Jes Holtsoe (Jes Holtsø) recently was awarded “Danish Blues Musician of the Year 2012." The award ceremony took place September 26th at the Copenhagen Blues Festival. 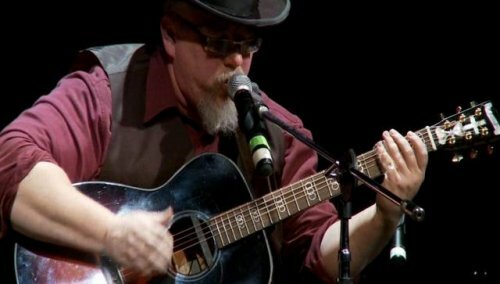 Holtsoe catches his audience with personality, integrity, honesty, soul and charm and especially his unusual and intense voice. He and his swinging, rocking blues band offer a refreshing take on how blues, soul and rock can be mixed into a broad, contemporary and lasting musical expression. This year’s award recipient was born in 1956 and raised in a musical home, with a singing mother and blues and jazz on the record player. His first claim to fame was as a child actor in the Danish Olsen Banden movies and on TV in the series The House at Christianshavn. After 13 years in the movie business, he disappeared from the screen, but then returned 20 years later in the talent show Talent 09 on Danish National TV, as a blues and soul singer. In the 20 years away from the spotlight, life on the edge was hard on him, but he managed to get back to life, very possibly by way of accepting the fact that “living the blues” could be transformed into “playing the blues”, as he describes in his book, The World is Waiting. The idea, and the willpower to carry it through has certainly paid off, and has surprisingly and quickly brought him to the forefront of the Danish blues scene. The rise happened only after taking part in Talent 09, where he met his, now permanent musical partner, Morten Wittrock (pictured below with Jes). They released their debut CD in 2010. In the spring of 2012, Jes released, Big Easy, with lyrics by Ray Weaver and music by Morten Wittrock, who also produced it. 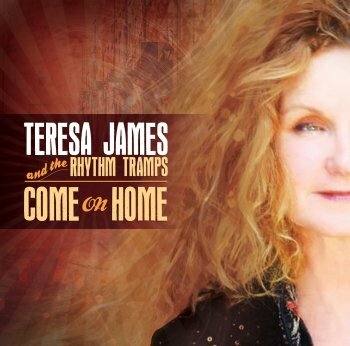 The CD was mixed in Nashville with producer Matt Andrews who has worked with artists like Sheryl Crow, Delbert McClinton, John Mellencamp, Garth Brooks, Kenny Rogers and many others. 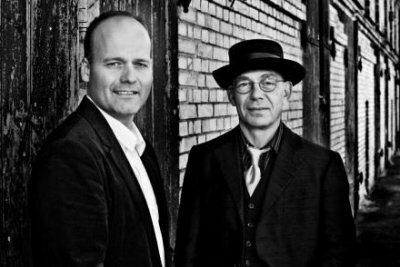 The ambitions were high, and the close Danish-American co-operation has lifted Big Easy to a level where blues music and audio doesn't get much better. With his personal background, his raw voice, and a swinging and rocking blues band behind him, this is a true Bluesman. The award was founded in 2001 by Copenhagen Blues Festival as appreciation of a Danish blues musician who has made a special musical and artistic effort of importance for Danish blues music. 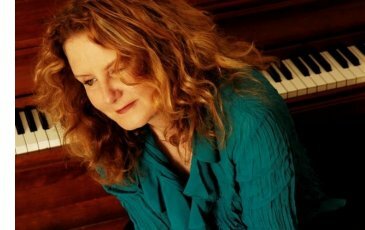 TORONTO BLUES SOCIETY PRESENTS "BLUES SUITE"
Diana Braithwaite and Chris Whiteley were commissioned by the Toronto Blues Society to create a work of music titled "Blues Suite" with support from Canada Council. On Friday October 19, the Blues Suite will be performed live for the first time at Glenn Gould Studio (250 Front Street West, Toronto, ON Canada). The culmination of two years of work for vocalist Diana Braithwaite and vocalist/multi- instrumentalist Chris Whiteley, this concert is a collection of original blues songs commissioned by the Toronto Blues Society. It is yet another remarkable accomplishment for a duo that has committed itself to keeping the blues alive since joining forces in 2005 for the acclaimed breakthrough release, Morning Sun. Tickets are available through the Massey Hall box office. If you are a Charter Member of the Toronto Blues Society, call the TBS office at 416-538-3885 to get the discount code for 20% off the ticket price! Public tickets can be purchased by clicking here. Please help Bruce Conte as he battles leukemia. 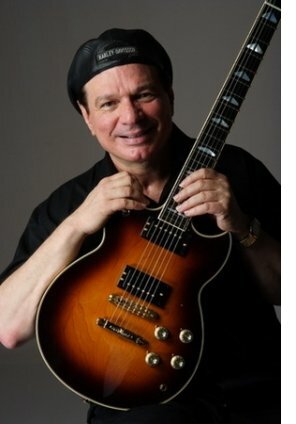 The former Tower Of Power guitarist (1972-79), has been diagnosed with Leukemia. Bruce is responding well to prescription medications and, as Bruce explains, "the good news is that I can stay alive as long as I continue taking them." Due to a pre-existing diabetic condition, Bruce has no insurance and there is no generic available for these new prescriptions. The bills are quickly mounting and Bruce needs our help. Family and friends have stepped up, but more help is needed. Please consider donating any amount here or by visiting the Tower Of Power website. 100% of the money will go towards Bruce's medical expenses. You know Stax, and Motown, and Atlantic, but there is another great blues and soul label you may not know at all. 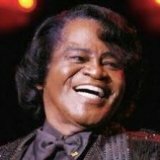 And yet it was home for over twenty years to some of the most famous R&B artists out there – James Brown, Wynonie Harris, Little Willie John, and Freddie King, to name but a few. Elwood is talking King Records, out of Cincinnati Ohio. 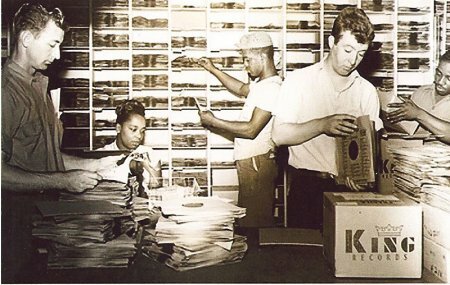 Elwood visits the Queen City and hears the amazing story of King Records. 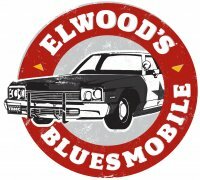 Next time, in the BluesMobile. The Blues Foundation, 421 South Main, Memphis, TN 38104-4464; OR fax to 901.529.4030; OR e-mail it to jay@blues.org.